more of a sparing contest between males which usually does not result with injury. Hummingbird behavior is understandable based on size alone. If you were that tiny, wouldn't you like to be exceptionally strong and aggressive too? In terms of surviving in the bird kingdom I would. In the past and even today, hummingbirds are highly credited for their great courage. So small, yet built to fight, they can take on an opponent of there own species without hesitation. Yes, there is some species of hummingbirds that fight other species for dominance. One example is the Rufous species who will fend off the Anna's, Broad-tailed, Calliope and Black-chinned hummingbirds. They can also use this ability to fend off some other types of birds, such as blue jays who are much larger than them. You might be interested to learn that hummingbirds don't always fight strictly with their bodies. A gentler tactic they use is sound. When an intruder approaches, the bird increases the speed and intensity of the song. Some wonder why the beautiful hummingbird, symbolized as love, cannot live in peace and harmony with each other. I shot this video in the early Spring of 2012. This battle went on for hours. They would spar for long periods of time, disappear for a while and return to the feeder for another match. As you can see in the video, one of the hummingbirds gets hit hard, knocked down into the hedges below the feeder, revives and returns to the battle. Hummingbirds are aggressive because they are territorial. Male hummingbirds are very aggressive when claiming a new territory. Keep in mind that this is essential for the survival of the female and her young. The male claims a territory and breeds with several females. These same females then gain full use of the territory to nest and raise the brood. The males chase off all other males. The anatomy of hummingbirds allows them to fight aggressively. They have excellent eyesight and will perch for long periods of time near a feeder or flower garden territory to keep vigilance. When an intruder is seen the bird can zip down in seconds with wings made for this speedy flight. This is the first attempt to chase off the other hummingbird. As you did witness in Jim’s video above, this isn’t always as easy as that. Soon, hummingbirds will begin to use their sharp beaks and claws as weapons against one another. We cheered (and you probably did too) as we watched the hummingbird in the video that was knocked down and then recover from his fall. He may have looked injured but this usually does not happen in these battles. These territorial fights can go on for hours. If this is the case a great deal of energy is expended. One hummingbird usually surrenders. 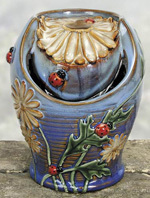 Sadly, much less commonly, there are cases when damage is unrepairable. All Puffed Up and Ready! When hummingbirds fight, they can look hysterical. They puff themselves up to look as large as possible. Tiny hummingbirds are given this ability to fluff out their feathers to appear threatening. It is true that from our vantage point a hummingbird is small whether or not its feathers are puffed out but to another bird looks can show strength. Again, we see a natural adaptation that benefits their survival. Some have mistaken hummingbirds fighting for playing. As we have explained this is definitely not the case. Hummingbirds fight to defend their food supply and the food supply of their offspring. However, if this fighting spoils your enjoyment when watching hummingbirds, there are things you can do. First, remember that the birds have the fastest metabolism of any bird. Nectar is the end result of all fighting. 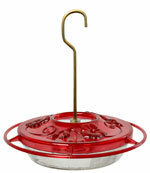 If you provide only one feeder you will have trouble with several birds fighting over the feeder. Simply put out more feeders. Learn all about how many you may need and where to set them here. Flowers are an additional source of nectar. You can always add some flowers to your garden. This may not eliminate the problem entirely but can reduce the incidence of fighting. In any event, be reassured that this is only nature fulfilling its plan. Hummingbirds can be a great source of inspiration for many us going through a rough time. We can remember the fierce strength and courage of the tiny hummingbird and its own struggle for survival. Due to their bravery shown through aggressiveness, the Navajo American Indians and some South American cultures admired the hummingbird for this behavior. 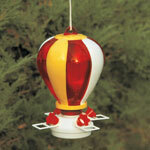 As we have said, seasonal hummingbirds establish territory in the spring upon return from migration. There are non-migrating species that will also engage in territorial fighting for food supply. 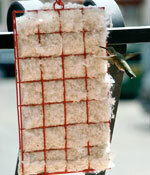 However, some hummingbird species are less territorial and share feeders peacefully. The Ruby-throated hummingbird is known to be the most territorial. We find that even our Ruby-throated hummingbirds will share feeders in the late summer before the Fall migration. This change in behavior is caused by the addition of young Ruby-throated hummingbirds that will share feeders. There is no reason for them to fight over territory because they won’t mate until the following Spring. In the late Summer, early Fall, the adult hummingbirds have increased need for nectar. Soon they embark on a tremendous southern journey and must bulk up body weight. So occasionally, they too will share. Hummingbirds are active in every sense including territorial disputes and are always interesting to observe.